I like to consider myself a late bloomer, meaning someone who will eventually, however late, come into bloom. Although when and if I will bloom remains a mystery. I wish I knew how to speak a foreign language fluently. I wish I knew how to cook a simple roast chicken, or that I had read The Idiot , whose main character sounds like someone I can relate to. In quick succession, Amy Cohen lost her job writing sitcoms, her boyfriend (with whom she'd been talking marriage), and her mom, after a long bout with cancer. Not exactly the stuff humor thrives on, is it? But filtered through Amy's worldview, there's comedy in the most unexpected places. In this unforgettable, engaging memoir, she recounts her (seemingly) never-ending search for love, her evolving relationship with her widowed dad, and her own almost unintentional growth as she stumbles through life. 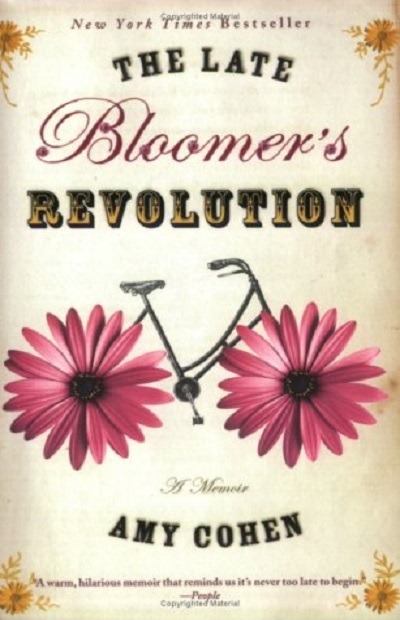 Filled with observations sweet, bittersweet, and laugh-out-loud funny, The Late Bloomer's Revolution will be irresistible to anyone who believes her greatest moment is yet to come. Amy Cohen always imagined that by age thirty she would be juggling a thriving career, a devoted English husband, and two adorable children who had shag haircuts and a room in their loft where they could play the drums. But at thirty-five, as she struggled to come to terms with the loss of her adored mother, she found herself "between jobs" (she'd been fired), "between boyfriends" (she'd been dumped), and "between apartments." She didn't know how to cook. She didn't even know how to ride a bicycle. Amy felt as if her life was behind schedule . . . way behind. The more time passed, the more difficult it became for her to believe that she would ever come into her own. The only thing that made her feel hopeful - and even determined - was the idea that she might be a Late Bloomer. She kept telling herself that things would change, that everything would happen for her, just not in the time she expected. As it turns out, she was right.